If you’re looking for pure relaxation, stunning azure ocean, white sand beaches and customer service perfection, a Maldives honeymoon will tick the box! The world’s lowest country has built itself on hospitality where nothing is too much and luxury is king. It’s home to the world’s best hotel, Gili Lankanfushi where you’ll have a private villa with a rooftop bed under the stars, personal butler and private sea garden just to start! Spend your days on kayaks, jet skis or wind surfing or spend them doing nothing at all. The Maldives has some of the clearest waters in the world that invite you to hop off your deck into the warm Indian Ocean and snorkel or dive with turtles, clownfish and even the world’s biggest fish, the whale shark. Many of the resorts are on their own private islands so you will have to take a ferry or seaplane there from the hustle and bustle of the capital city of Malé. Maafushi in the South Malé Atoll is just one of an increasing number of inhabited islands offering budget friendly accommodation that is chic and offers excellent customer service. 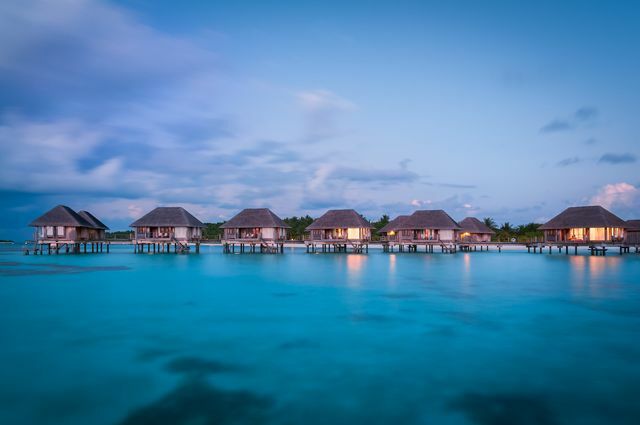 So whether you’re looking for absolute privacy with an overwater bungalow or snorkeling at uninhabited islands with a liveaboard boat or intimate service and proximity to a town with a guesthouse, a Maldives honeymoon is perfect for you. The temperature in the Maldives hovers around 80 degrees year-round. May to November is monsoon season but the weather is still warm and prices are considerably lower. Whilst marine life is more varied on the western atolls at this time, it should also be noted that there is little to do on a rainy day on private islands. December to February is a very popular time to take advantage of the low humidity and blue skies but there is a huge hike in prices over Christmas and New Years. March to April are the shoulder season with good weather, lower prices and the start of the surf season—ideal for Maldives honeymoons. Anyone planning a Maldives honeymoon?